Alright people, lets get something straight and build some context for future discussions. 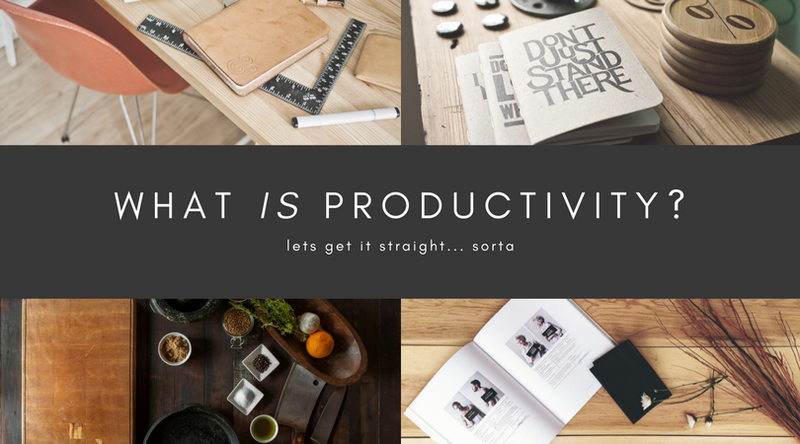 What exactly IS productivity? There are more blogs and website dedicated to improving productivity than I care to admit. One challenge we have with so much information, strategies, thoughts, and ideas on the subject is ensuring we are all participating in the discussion with the same context. Now, if you want to define “productivity” differently than I do, be my guest. Just know that my participation in this discussion over understanding it and improving it will be based on the context I set here. Productivity is a measure of output from a production process, per unit of input. For example, labor productivity is typically measured as a ratio of output per labor-hour, an input. I like that… so improving productivity is about getting more with less or with the same, improving efficiency. That is a pretty broad concept however. What is “input” and what is “output”? Are they the same for all people? probably not… Each of us likely has our own definitions of desired outputs and our inputs will also be very different. Based on our circumstances, our family plans and desires, our occupations, our hobbies, these are all going to be very different. Put simply personal productivity consists of all the virtues an effective employee has. These areas are: efficient learning, personal organization, time management, mental control, creativity, and decision making. That is pretty good as well… focusing more on the efficiency factor than the components that make it up. Finally, I will give my definition of personal productivity…. Productivity is the process of satisfying accomplishment of your personal mission while maintaining life balance including the exploration of creativity, peace of mind, personal and professional achievement, interpersonal relationships, and the growth of knowledge and character. That may be a lot to swallow and too broad for some but without each component, productivity becomes fruitless, mundane, unbalanced, or simply busy-work. Even if you get stuff done, who cares!! The Why is so much more important than the how or the what. Wow, you read 400 books in one day, who cares? what for? Knowing why we do something and how it fits in our personal “big picture” makes everything much more worth doing. It also helps you see the best, most efficient way to do things… for you. This understanding of your productivity gives you the personal context you need. It’s not about what someone else thinks is productive for you, its what you think is productive for you. I like the idea of Accomplishment rather than simply “getting stuff done” (as you may have read throughout the site). Getting stuff done is just busy work. Accomplishment is much more and takes into account true productivity. That is the beginning of understanding productivity. As with everything here, context holds half the meaning and having meaning is why we are all in business.